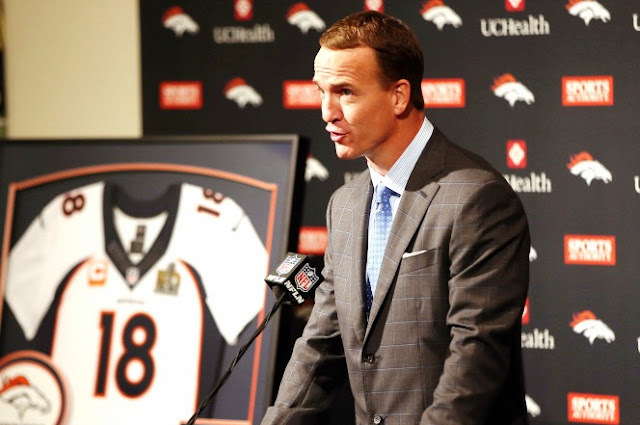 “Peyton Manning’s extraordinary career was driven by his talent, an incredible work ethic, and an unwavering desire to be the best and ended so perfectly for him with a Super Bowl victory. Peyton’s competitive fire and love of the game made him a legendary player who thrilled fans for a generation. He has served as a great representative of the NFL both on the field and in his community. We are forever grateful for Peyton’s unmatched contributions to the game and know that his success will continue in the next phase of his life” , Statement by NFL Commissioner Roger Goodell. Peyton Manning announces his retirement on Monday put an end to the speculation of whether the five-time NFL MVP would attempt to play one more season as an NFL quarterback. He mostly held it together, but there were moments when it was obviously hard for him to realize he was saying goodbye to the NFL. It was an emotional day. "There is something about 18 years ... 18 is a good number," Manning said. "Today, I retire from pro football." While the decision may not come as that much of a surprise to many after the 39-year-old struggled to stay healthy and produce on the field last season, a number of former teammates and sports figures took to Twitter to give their thoughts on the news. Manning called the Broncos on Saturday night to inform them he would be retiring. The Monday news conference had been previously scheduled, but the Broncos didn't know what Manning's decision would be until he made the call.